This past Sunday marked the 101st anniversary of the fire at the Triangle Shirtwaist Company factory. This incident had, before the September 11th terror attack on the World Trade Center, the dubious distinction of being the worst fire-related workplace disaster in New York City history. The level of qualification present is an important element of its description, as there have been worse incidents of loss of life, in New York City, in fires, and in labor disasters generally. Despite this, the Triangle fire holds an iconic place in the history of labor relations and progressive politics. In the standard narrative, the Triangle fire was the result of the unsafe working conditions and inhumane policies maintained at workplaces in the heyday of laissez-faire capitalism in the United States. The tragedy of its hundreds of deaths started a reform movement in government to create workplace safety regulations with teeth, resulting in the relatively safe working conditions we enjoy today. More complete treatments mention the strikes and protests by the labor movement leading up to the fire, and Tammany Hall’s obstructions and corruption. What comes out of this narrative is the clear message that the Triangle fire is why we have workplace safety regulations and that the government is exercising proper authority in enforcing them. Before today, I never knew how satisfying it was to sarcastically congratulate people for successfully propagating a fraudulent exposé made by Neo-Nazis. 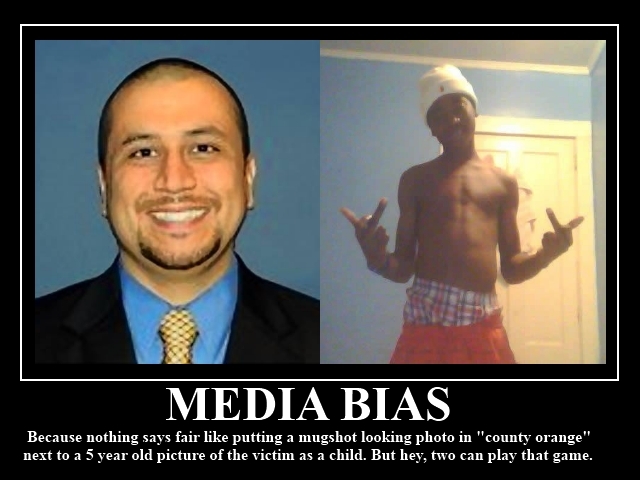 However, I think it would be a shame if this amazing reversal of fortune obscured the fact that even if the Aryan culture warriors responsible for this image macro weren’t using a photo of the wrong Trayvon Martin, that is, if the boy on the right were the boy who got shot, it would still be a bunch of idiotic racist garbage. …yes, that’s more like it, this is the side-by-side that seems to have gotten the sensible middle ground up in arms. On the left, a teenager who was shot to death, on the right, a grown man who shot and killed an unarmed boy. I can tell you right now, if it wasn’t for that orange (prison?) shirt and (comparative) frown on George Zimmerman and the sunny smile on the face of Trayvon Martin, I wouldn’t know who to root for! Clearly, the way to restore the balance upset by the insane, politically correct, liberal media is to compare a picture of a smiling grown man who shot and killed an unarmed boy with a teenager who was shot to death depicted in a tough guy pose and flipping the bird. That changes everything around. I’m pretty sure that teenaged boys who have never done anything as immature and stupid as striking macho poses and making obscene hand gestures to be “edgy” are in the minority. 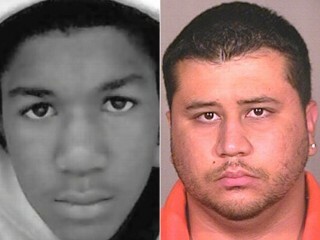 So really, even if that were a picture of the “right” Trayvon, it doesn’t actually reflect poorly on him. He’s a 17 year old boy, stuff like that is par for the course. 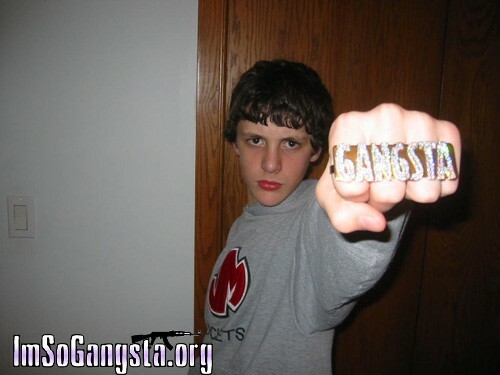 Actually, this specific form of goofy posing seems to be popular with people of all ages and races, if a quick review of ImSoGangsta.org is to be believed. Another picture you won't find in the MSM! But here I’m kind of giving the game away, aren’t I? It’s not that “Trayvon” is just puffing up like an adolescent, it’s that he’s doing so like a gangsta. He’s embodying Thug Culture. 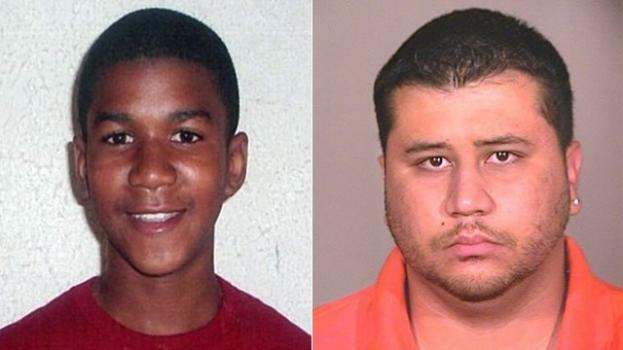 Now, why does comparing a smiling, composed, suit-wearing Zimmerman to a “thugged-out” Martin restore a balance that was lost in a side-by-side depiction of a smiling, well-behaved Martin and a glowering Zimmerman mug shot? What sympathies are supposed to be reversed? What viewpoint would I have to assume to actually find the shot of “Trayvon” repping his set threatening enough to feel, if not good, then at least not disturbed by the thought of Zimmerman shooting and killing him? It’s hard for me to see that pose as anything but funny in a childish way, but I’m going to take a guess at the counter-narrative this meme is supposed to present. It’s the one where black men and boys are all potentially violent criminals and respectable white men carrying guns are the protectors of civilization. So even if that image macro up top weren’t a fraud, if you posted it or passed it around like it was some mind-blowing revelation, you’d still be a dope spreading racist bile. In my review of 1491, I wrote about Mann’s revision of traditional narratives about Indians in history, how “the portrayal of Indians as passive recipients of European actions, either as enemies or victims” is false, as “the first peoples of the Americas were active in history…” Activity in history is an important theme of much recent scholarship, especially in the study of traditionally marginalized groups. The reduction of Indians to passive victims or unthinking barbarians, either way destined to be swept aside, is prevalent in the historiography of other peoples, such as slaves and the victims of colonialism. Note the construction I used, almost reflexively: “victims of…” This thought process is the problem which the new narrative of historical activity seeks to rectify. It is the study of agency. Agency, in simplest terms, is the ability of a person to be an actor, to be at least partially in command of her own destiny, rather than a “thing” that is acted upon or manipulated. It’s an important shift in the narrative of marginalized people. The first accounts were those “written by the victors,” which justified conquest by the vices of the conquered, or glorification of the conqueror’s virtues. This account, in addition to rendering marginalized peoples into passive things, made them into villains. The first round of corrective revision focused on the moral dimension and ignored the issue of agency. Essentially, the moral narrative is reversed: marginalized peoples had more virtue than had been recognized, their vices had to be placed in context, and the process of their marginalization and subjugation was a great crime. While a useful corrective to an account of history that effectively functioned as apologia for power, and which still serves that role, it still relegates its subject to the margins, now as victims of historical injustice rather than righteously punished enemies. They are still not actors in history. The new narrative of agency corrects this aspect, but invites other problems. One significant “mixed blessing” is in abandoning the moral argument. On one level, continuing a moralization of marginalization beyond the point of counterbalance returns to a propagandistic mode that obscures our understanding of history, and so an “amoral” or value neutral exploration is desirable. On another, it’s problematic when agency itself becomes a moralized virtue. After all, few would doubt the “agency” or the conquistadors. Agency can mean active complicity in some truly horrific things. Moralizing agency as something to be celebrated rather than explored can also lead to an exaggerated glorification of historical actions in anachronistic ways. In “The costs of coercion: African agency in the pre-modern Atlantic world,” Stephen D. Behrendt, David Eltis, and David Richardson give an account of slave revolts aboard slave trading ships that exemplifies the different aspects, positive and negative, of placing emphasis on agency in history.1 It is also a fascinating and informative analysis of the economic dimensions of the slave trade. Essentially, the frequency of revolts aboard ship increased risk in the trade and thus raised the costs of shipping slaves. While each individual revolt was unlikely to succeed, the constant fear of revolt required preventative measures which raised costs, and thus prices, leading to reduced demand (when compared to a hypothetical slave trade that did not need to fear revolts) and thus lowering the volume of trade. In what I would call a “neutral” application of agency analysis, the authors examine the frequency of revolts by region of origin for slaves. Different parts of Africa apparently yielded slaves with differing likelihoods for shipboard revolt, and this correlated with European “patronage” of these regions: slaver traders focused on markets in regions from which they could buy slaves who tended not to revolt aboard ship. Thus, the character of Africans shaped the patterns of the slave trade. This is what agency means in the broadest sense: people in history having a significant effect on its course by their own actions. There is no moral dimension to this observation, it simply relates how Europeans had to react to the actions of Africans, and how this affected the cultural makeup of slaves in the Americas and thus the contributions of Africa to the nature of the nations and societies formed in the New World. Indeed, on a large enough scale, the effects of slave revolts on the Middle Passage had massive historical consequences. The risk and thus cost of transporting slaves meant that Europeans were less keen to begin importing slaves, and more keen to stop. In essence, other methods of obtaining productive labor were more attractive, for longer (in the case of European colonists and native workers) and earlier (in the case of industrialization and contracting cheap wage labor from other parts of the world). Revolts on slave ships thus shortened the duration of the slave trade. The aggregate decreased demand also led to a decrease in the total number of slaves sold. The authors calculate that in the 18th century, 600,000 fewer slaves were transported to the Americas as a result of the increased costs of preventing revolts, meaning that every rebel aboard ship saved many other Africans from slavery. This is where agency has the potential to become problematic. To describe this aggregate effect in terms of salvation, as the authors do, is to apply a moral value that is somewhat anachronistic. From our perch in the present, we see this large-scale effect, but the mutinying slaves themselves were unlikely to have had this perspective as a motivation. There is inspirational bravery in their desperate fights for freedom, but basing further valorization on historical consequence occludes history. It creates heroes of legend rather then actors in fact. Still, this is more of a stylistic concern than a cause for alarm. Learning about the positive effect which these slaves in revolt had is heartening, and valorizing them and the importance of their actions reveals a useful lesson about the importance of resistance, even if it seems futile. The authors are not engaging in propaganda simply for finding legitimate inspiration in the record they have uncovered. The authors then turn in their analysis to events in Africa, and this is where a possible “dark side” to appraising agency appears. When Europeans first began expanding into the Atlantic, their first probings and colonization efforts crept down the coast of Africa. However, they were unable to effectively control very much territory on the continent itself, and were not able to subdue local populations and polities. This forced the march of the plantation economy to change direction and move all the way across the ocean, to South America. In effect, the active resistance and strength of African polities resulted in the distance between the site of production and the source of labor that necessitated the slave trade. A simplistic evaluation of this effect (which, I should make very clear, the authors do not make) would seek to place blame. It would say that Africans are partially “at fault” for the slave trade. Among other problems with this judgment is that it ignores European agency, and thus responsibility, for seeking to create a plantation economy and buying slaves to run it. Additionally, it is in some ways as “anachronistic” as idolizing slaves in revolt for saving people in Africa from slavery through the high-level operation of market forces. Native Africans did not seek to create a transatlantic slave trade, they sought to keep control of their land. The African “role” in creating the slave trade was something of a side-effect of their actual motives, as much as was the African role in reducing the volume of the trade through revolt. Where agency becomes problematic is in celebrating agency itself as a virtue, regardless of whether that agency is used for good or ill. The authors explore the fact that Europeans had to buy slaves from African elites, which necessarily implied that Africans and Europeans were on equal footing in the trade. While the authors note that this arrangement also reduced the volume of the slave trade, as Europeans could have obtained slaves much more easily by direct raiding, which they were not actually able to conduct, it’s possible to come away with the sense that African complicity in slavery is to be celebrated for the power it demonstrated. The fact that Africans had agency in the trade overshadows, in significance, their participation. We would look with suspicion upon an analysis of the European role in the slave trade that celebrated their business savvy and determination in building new societies at a perilous cost. Yet this is the mirror image of a celebration of African agency in the slave trade, rather than a simple examination. This is also, in some sense, a simplistic analysis, but simplistic analyses are the heart of political abuses of history. By noting the aggregate effect which Europeans being forced to negotiate with African elites had on the volume of the slave trade, the authors clearly are sensitive to this. And yet, at the same time, the article’s very title puts agency front and center, thus making it seem to be a virtue in itself. The risk of abusing such an impression, however unintended, is lessened to the degree that agency is simply a factor to look for in traditionally ignored areas rather than imbued with an inherent significance. Much like the first round of revision, wherein the morality of marginalization in history was reversed, emphasis on agency is a useful corrective. And like that earlier revision, agency as a cause for celebration in itself runs the risk of distorting the record and inviting opportunistic abuses of history, however cautious historians may be to head off this possibility. 2. See, for examples: “Cornerstone Speech” by Alexander H. Stephens, Vice President of the CSA; “Slavery a Positive Good” by John C. Calhoun; and other examples from an article on “compensated emancipation” by Ta-Nehisi Coates. …[there is an] important difference between Teddy Roosevelt and Barack Obama. Roosevelt believed that government should level the playing field to create equal opportunities. President Obama believes that government should create equal outcomes. …the basic American promise [is] that if you worked hard, you could do well enough to raise a family, own a home, send your kids to college, and put a little away for retirement. So much is bundled up in a phrase like that. In its brevity and simplicity, it’s a masterpiece of sloganeering. What we learn from this is that there are some people who are concerned about the less fortunate and would like to see them given the means to compete in the market and go as far as their talents and virtues will take them, and others who would destroy the justice of market competition by ensuring that everyone is equally rewarded regardless of virtue. Somehow, the former, a basic tenet of American liberalism, is taken up by conservatives, and the latter, an encapsulation of the most radical communism which the world has rarely seen in reality, becomes the ideology of Democratic Party. This is a common general tactic. It involves taking ownership of a popular virtue in order to seem mainstream and moderate, so that any party in opposition is implied to lack or attack that virtue. You can see it in market conservative rhetoric about economic regulations: marketeers are always in favor of “good” or “smart” regulation. We never learn what this means and what actual regulations they oppose, because we are not meant to; we are only meant to accept the wisdom of their regulatory policy and assume that leftists support “bad” or “dumb” regulations. It’s a favorite in pseudoscience circles, too: proponents of anti-vaccination snake oil present themselves as skeptics of corporate power, as if acknowledging the health benefits of vaccination were equivalent to being a corporate stooge. This tactic is an implied straw man by which whoever uses it switches his opponents’ actual motivation with his opinion of their ideas. In doing this, he ignores the need for the balance of competing interests. We should be skeptical of the intentions of big corporations, but does this really mean abandoning any medicine made by pharmaceutical companies? Regulations may have adverse effects, but are those who propose or support a regulation either unconcerned about these side-effects or maliciously inflicting them? Or do they see these downsides as balanced by some benefit? When it comes to discussing the equality of opportunity vs. outcomes, the implication is both subtle and complex. It essentially compares a phantom social welfare program (an implicit and unelaborated ideal policy of equalizing opportunity) to a real social welfare program, implying that the possible effects or necessary methods of that program (redistribution of wealth) are the actual goals. Broken down like this, it’s very clear how hollow this rhetorical trick really is, so how can it work so well? Opportunity: Every citizen needs the chance to participate in a dynamic and high-tech economy that is more and more based on knowledge. Additionally, meaningful participation in the democratic process requires knowledge and critical thinking skills. Outcomes: Parents work hard to provide for their children, including efforts to enrich their lives with knowledge and culture. But some would seek to make sure that regardless of their talent or hard work or how much they care for their children, all parents will be able to educate their children, from kindergarten to college. Worse, those who, by their hard work and productivity, could otherwise afford to do better for their children by paying for higher quality private schools, have their just rewards taken from them and given to parents who have not done as much to provide for their children. Opportunity: Sickness and injury are risks we all face, and accessing medical care is a great expense. Those of meager means may become economically trapped, unable to try and change careers or take the risk of starting their own business for fear of not being able to afford medical care in the event of an injury or sickness. Worse, people with “preexisting conditions” may be unable to obtain any medical insurance besides what is provided as a benefit of employment, drastically reducing their options. Ensuring that everyone has access to healthcare enables people to take risks and improve their prosperity. Outcomes: Medical care is a precious resource, a repository of amazing talent, skill, and technology. Equalizing access to healthcare not only removes an important incentive to work hard, it cheapens the nature and value of the profession. Why should doctors be forced to care for anyone at some state-mandated rate, and why should the prosperous and successful provide the luxury of medical care for the lazy and unproductive? Opportunity: While everyone should work to secure their own prosperity, no one is free from the economic risk of unemployment. By providing a basic stipend and subsidizing food purchases for those who are looking for a good job, we ensure that no one need fear absolute destitution and everyone has the chance to get back “in the game” without settling for less. Outcomes: Competition in the market gives everyone a chance to rise to the limit of their talents and earn rewards for their efforts. Distributionist policies undermine this principle. When everyone is given enough to get by regardless of their efforts, paid for by those who do have the work ethic and creativity to succeed, the incentive to be productive disappears. Opportunity: Money pays for the investments that grow one’s prosperity. Additionally, the more money you can rely on, the more freedom of action, unconstrained by economic means, you have. Outcomes: Clearly, riches and luxury are the reward of hard work, creativity, and ambition. Neither stance is really wrong, for the simple reason that it’s not possible to improve opportunity without the resources provided by outcomes, and anyone who takes advantage of a provided opportunity will likely get better outcomes. Every government program, therefore, which attempts to equalize economic opportunity will require funds taken from citizens’ economic outcomes as tax revenue. The end effect of making these opportunities available is to empower more people to improve their prosperity, thus moving the distribution outcomes closer to equality. Thus, when a pundit or politician claims to support equality of opportunity while opposing equality of outcomes, she is taking up the mantle of social conscience and compassion while damning its necessary methods. This gives her license to attack any real program for equalizing opportunity while looking like a champion of fair policy.